For starters it is a very safe and effective car seat and a GREAT investment in your child's safety while riding in a vehicle. I love the design especially the click attachments...SO SMART and easy to do. I can tell my son loves it and has much comfort especially when he falls asleep. Absolutely love this car seat. Clearly solid and super easy install with the new hatchet style latch system. Lots of padding for extra comfort and cup holders a bonus. My favorite feature of this car seat is the easy latch system, saved me tons of time! It was so awesome to install it till it was perfect. First time my son (5 months at the time) that he sat in it he fell asleep so fast. He is now 8 months, and still loves his car seat. It's such a sleek and clean design as well, so it fits my car perfectly. I love this car seat & our daughter does too! She is 14months old & has never slept in the car.... that changed when we got this carseat! Its super stylish and is very sturdy. The car seat & sensor safe were both easy to install and use. Love the safety sensor, the alarm does take bit of getting used to though! Very impressed with the head & neck support. Would highly recommend this seat. The only negative I have is that the sensor buckle is a bit hard to open. I spent so long looking for a carseat that I loved with my first three kids and finally with my youngest child we got this one and love it. We made the mistake of getting staged carseats in the past and my favorite feature of this one so far is that it grows with your child. We got it when my son was like 8 months old and he has been using it for about a year and a half now. It's super comfy for him and never gets hot to the touch like ones we used in the past on a sunny day . I'd reccomend it to anyone. We had the Evenflo infant car seat before this one, and I was sad our baby girl grew out of it. We chose to stick with Evenflo getting the Everystage car seat, and we couldn't be happier! It's is extremely well made, and easy to use. Our little girl is so comfortable on long car rides, and it was easy to install. Thank you for such a great product!! 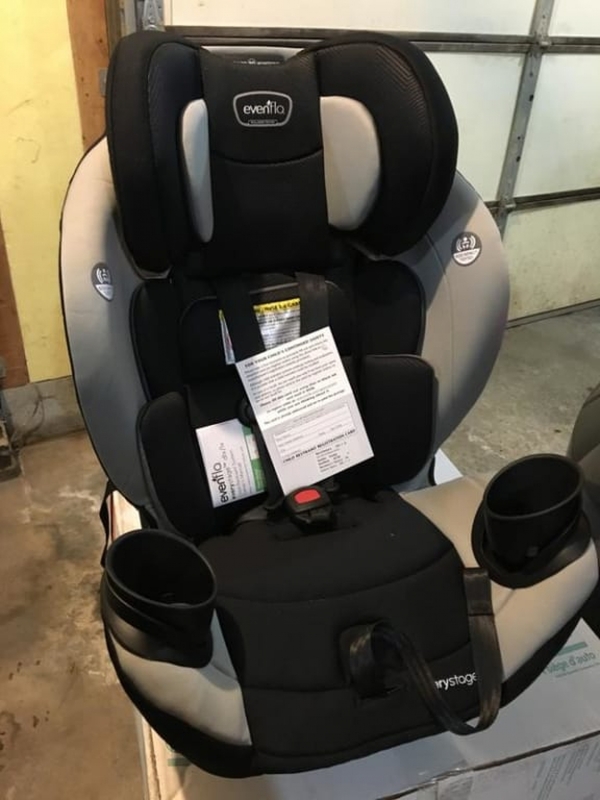 I initially purchased the Evenflo EveryStage car seat because Graco has had a lot of recalls, but since I have been using it, I have truly fallen in love with this car seat. It is super comfortable for my 5 month old, the Evenflo website allows me to choose the color I want, the install is amazingly simple (thanks to the easy click) and it's so nice to not have all the hassle of readjusting the straps. 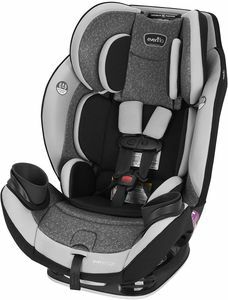 I love this car seat so much, I have actually talked several moms into purchasing an Evenflo EveryStage instead of a Graco car seat. Took a little more space up front to back than I would've liked but other than that this seat is everything we wanted! It looks really nice, it seems really comfortable, and super easy to install! I'm not sure who is more excited for the new carseat - my son (the intended user), or my daughter (now jealous sister!). Both kids absolutely love this carseat - the ample padding is definitely a must have to ensure enjoyable car rides. We have always been a Britax family, but this carseat is even better. I'm also thoroughly impressed with the different positions. 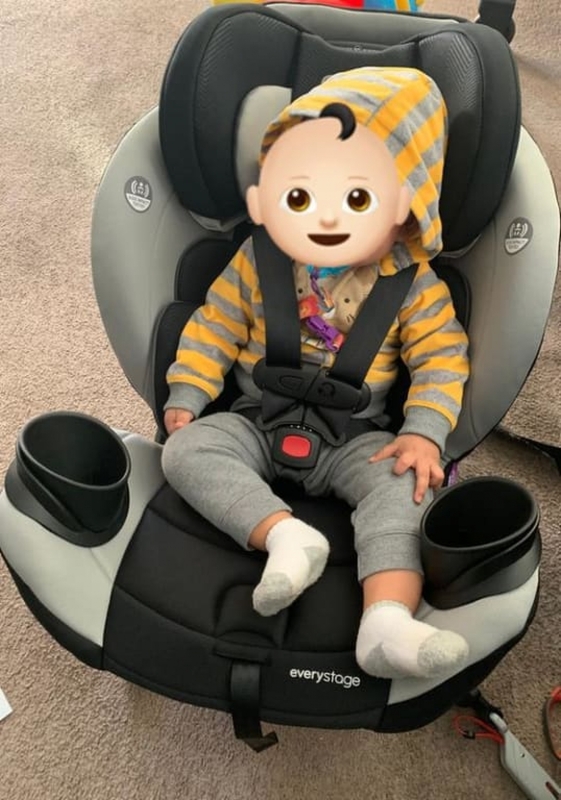 My son is already 21 lbs and is only three months old - thankfully this carseat is for every stage and can recline back but not take up too much room! Plus now I don't have to worry about head slumping, or his lack of head control. I always go on the looks and the appeal and the moment I saw this car seat we decided to take it, it looked so appealing and perfect. We swapped this car seat into my car from a graco nautilus 65 and it's been much easier to use! The installation was very quick and the ratchet latch was a great idea. We dint have to assemble anything it was all done beforehand is wat I liked the most unlike other car seats. The car seats is more secure and I feel that it is safer. He seems much more comfortable during rides. I love the recline options which are given it helps my son to sleep better I don't hv to put any extra head support or hold his head while traveling long distance while he sleeps. Very pleased with this awesome carseat. As an in-home child care provider, I am asked on occasion if I have a car seat I can borrow out for various reasons (car in the shop and for got to grab it, someone different is picking up, etc.) or I have children overnight/weekends. This seat is amazing. Not only do I feel 100% secure in loaning it out and personally using it, but it is so valuable in the sense that I do not have to keep 3 different kinds of seats here for varying ages/heights/weights. This should be every parents purchase. One and Done! It is easy to install and to clean (both issues at that are at the top of my list). The design is great and I like how it's designed to keep it from pressing up on the front seats when rear facing. Easy to identify markers to ensure it's installed correctly at each stage. Could not be more pleased with this car seat. This product is so easy to install. I got it to car around my nephews. As an aunt, I was looking for something that is easy to install and would last for a few years. I have an old CRV and was worried that it might not fit but it totally fit and easy to install. With a 2 year old and 4 year old, I'm looking forward to cart them around for many years to come. The new DLX system is so easy to tighten and the instructions are clear. Very easy to install, great for grandparents car. The instructions for this all in one car seat was very easy to understand. I also liked that the install was super easy. My babies were born 4 and 5 lbs respectively and I don't think I would have been comfortable using this car seat then because the padded doesn't seem to be enough, but now that they are bigger, they fit perfect and it will be used as an extra car seat in our vehicle. I LOVE this seat! Our little one just turned 4, but we are not ready to graduate to a booster. We were reaching the upper limits of her previous seat, so this will help us to keep her in a harness for at least another year - this makes me very happy! She likes the new seat - it's design offers her more range of motion and she is able to see more side-to-side. Two cup holders is also a plus. For parents installing forward facing straight out of the box: there are instructions about adjusting the angle of the seat and moving the latch system to a different belt path. I got a little confused because mine came the correct way out of the box. I was worried that I was skipping steps because mine was already how it needed to be. I think those instructions are for parents that have used the seat rear-facing first. Also, there is a weight limit on the forward-facing LATCH. We were already above the weight limit so we installed with the seat belt. If you are using with an older child, like me, keep a special eye on that. This car seat is very sturdy, but not extremely heavy like many other car seats built similarly to it. From box opening to installation, it took us about 15 minutes to get it situated because the manual was very clear and easy to understand. Adjusting the straps is very easy and the cup holders are a great size. 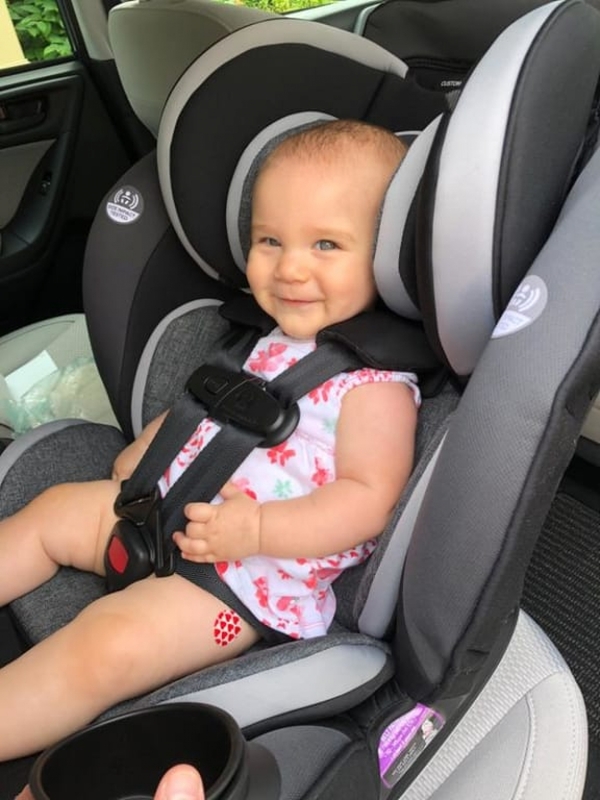 We love that we are able to rear-face up to 50 lbs in this car seat The removal loop on the the base-attachment strap is a little difficult to pull when we were readjusting the car seat. My daughter is 35 inches tall and 29 pounds and she was very comfortable and happy rear-facing in this seat. I like the dark colors with the gray and white for contrast. Removing and replacing the seat cover wasn't frustrating or difficult by any means! The seat belt and harness clips don't require excessive effort to press and the padding in the seat was not too thick or overwhelming. This is a great car seat! I installed this in my Jeep Liberty first, and decided to move it to my Honda Fit, both times rear facing for my 16 month old. I did have to research online two things I did not find in the manual: can the headrest of the seat touch the seat in front of it when rear facing, and can the base have any overhang of the vehicle seat. These things could be included in the manual for clarification. At first, in the Jeep, I didn't love the seat. It seemed too large and difficult to get a tight install. But I moved it into my Honda, and I LOVE it. Much easier to get the install tight enough and the recline perfect for him. Pros: 50 pound rear facing limit. Cushy without being bulky. Grows with the child, so you potentially don't have to buy as many seats. Fit surprisingly well in a small back seat on the most upright rear facing setting. The seat level indictor is extremely easy to read. The harness loosening is very smooth. Lower profile sides for getting him in and out easier. Cons: manual could be easier to read, I felt confused a few times when other manuals I have read did not make me feel that way. Is not super compact front to back if you need a lot of space in the front seats. I'm not sure how great this would fit with other car seats installed, I think it would be difficult to fit three across. All in all, it's a great seat in my main vehicle. My son notoriously hates being in the car seat and he really doesn't fuss as much being put into this one. I think the lower profile sides make a huge difference when you have a small car so you're not having to scrunch them as much putting them in. This carseat feels like it was built like a tank! It feels very safe and well built and is pretty easy to install. 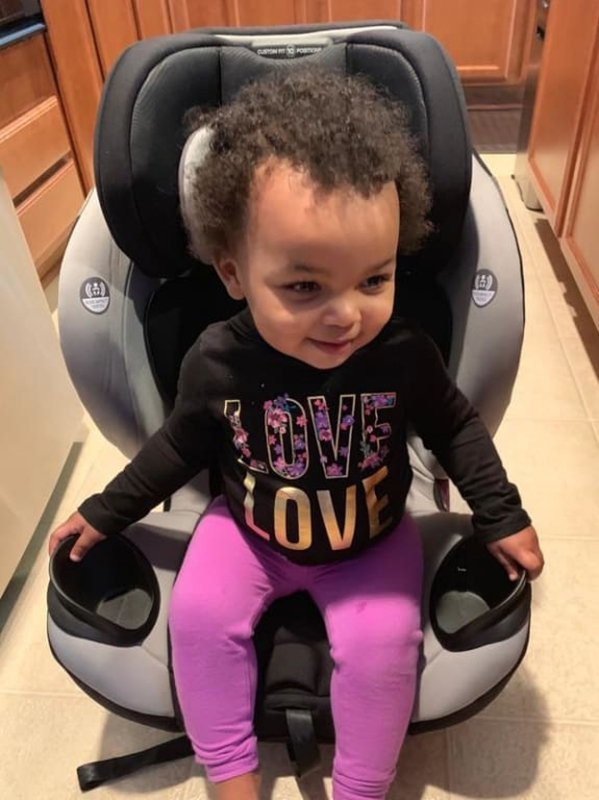 Feels a little big for a tiny infant but once a child is closer to 30 pounds or when an infant seat is getting small or child is too heavy to lug around in an infant seat this car seat is perfect. Good for 10 years and countless positions to grow and adapt to your child how could you want anymore from a carseat?! I Usually use a different companies products, but I really loved this product! I have two kids and I used it for both of them. Worked perfectly for the two. Was easy to set up in my vehicle. No doubt my kids are safe! The double cupholders is a plus... Both my kids can use one and no arguments. Will be looking to try more by them. We just recieved and installed the DLX. Pretty simple and straight forward. I have nothing negative to say. Wondering how hard itll be to wash the seat covers but if its anything like installing were in for a breeze. We love this car seat! The latches you lock the carseat in with are incredibly user friendly, the pull "string" beats fighting with the latches! My son loves the double cup holders. It's not too bulky, and has a very sleek look. 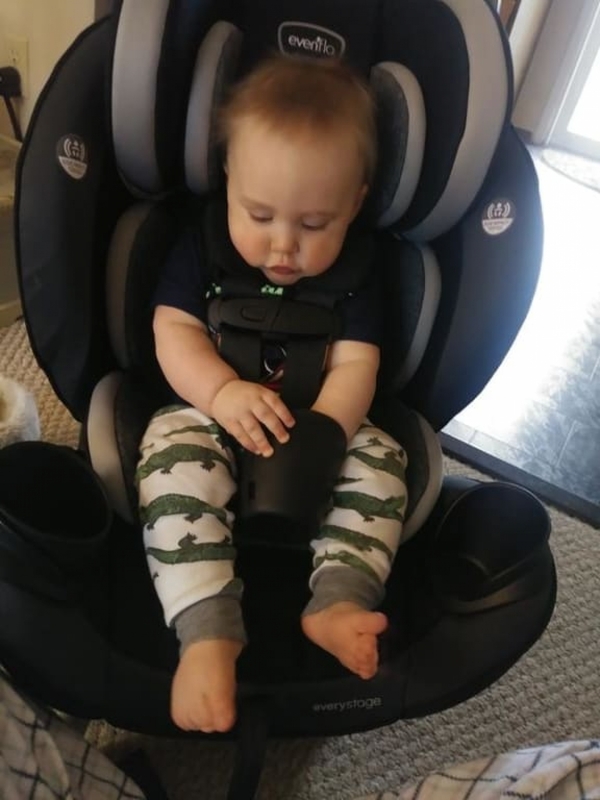 The seat itself has great cushion and head support, I love that we can use this as my son grows and he will still be comfortable! I absolutely love this car seat. My newborn is not a fan of car seats and cries every time I he is put into his current infant seat. The custom cradle fit gives me piece of mind after putting him in the car seat. He has better head support and is no longer sitting in a slouched position. He has been a lot happier in this car seat during car rides. This car seat is also padded very well. I hate when i have to purchase extra padding or use blankets to pad car seats. The car seat checked all my safety feature boxes. Having a car seat that will grow with my son is a plus. I don't have to worry about purchasing a new car seat at every milestone. We will be purchaing another Evenflo everystage LX for our second vehicle. I am not a fan of the removable cup holders because they come out to easily. My three year old is able to take them out with easy. I love the idea of having removable cup holders but they are to easy to remove. 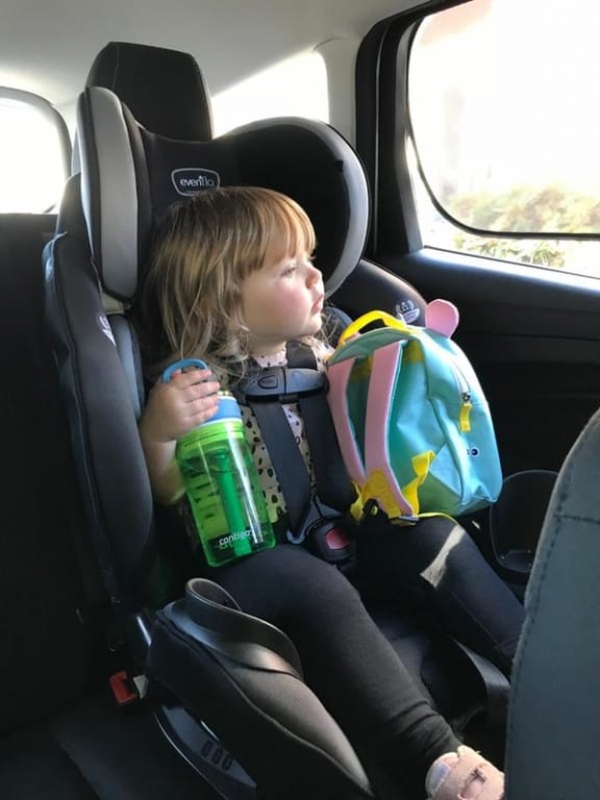 We totally love our EveryStage carseat. When we opened it, we did not realize that this chair was so versatile: It can be used for babies/toddlers/ youngsters between 4 and 120 pounds! We purchased this seat for our 6 year old (46 pounds, 44 inches) son, who used it a majority of the time in the front facing position. Our 13 month old used it on a few occasions as well, and we're looking forward to having her get as much use out of it as possible too!. 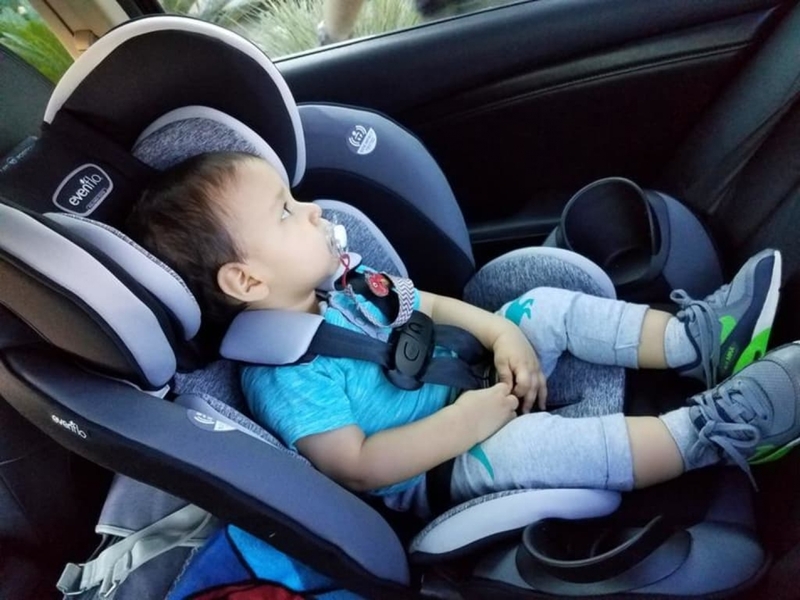 Our son had a small, backless booster seat with no vertical seat. It would occasionally move on turns, and it put his feet in the middle of the seat in front of him; which in turn led to kicking.�‚ Our guy was not thrilled to "go back to" what he viewed as a seat for "little kids", but a majority of the complaints went away when we made the swap, got him in (used as a Booster) and started driving. We call it his captain's chair. The features are good: He likes having his own cup holder, and I like that it wipes clean very easily. There's an adjustable headrest, so when he falls asleep on longer car trips, his read doesn't just lag to one side. We also like that the seatbelt goes through a belt guide that is on the seat, so the seatbelt isn't high on his shoulder. The fabric is soft and breathable( see point below). BEST of all? His legs are now in a better position, so he doesn't kick that often anymore! He definitely likes the new chair and we do too. Baby Seat: (1) weight: This isn't one of those seats that you'll take with you out of the car, but its honestly a good thing. It's studier than the "classic" infant and baby carriers and feels like it would hold up to.. more. 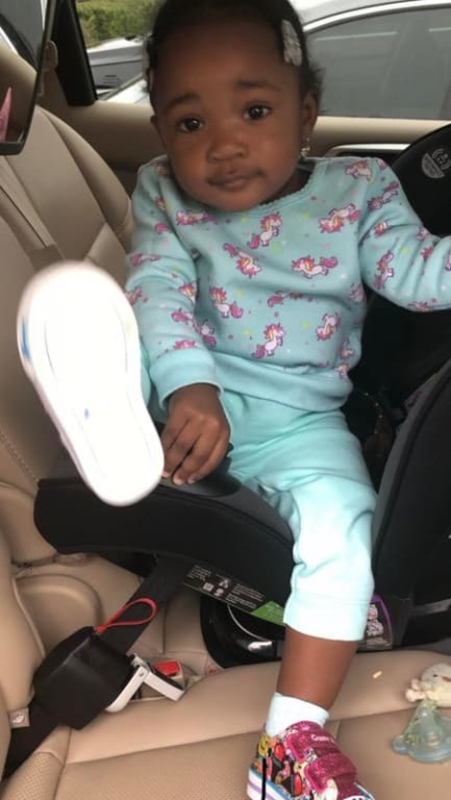 Though, (thankfully) we've never had to learn how much.�‚ �‚ 2)Temperature: Our daughter always seems to get warm on car rides, and tends to get cranky as a result. Usually we'll take her out of the car seat, and there's wetness on the carseat and her clothes from her sweat. 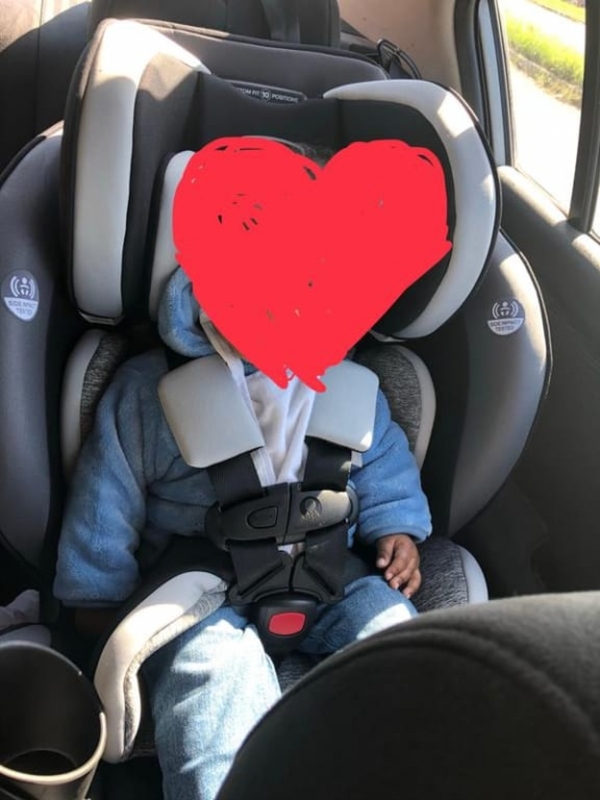 On the two occasions we used this seat for our 13 month old, we actually had the heat on in the car and there was no sweat or wetness on the seat when we got to our destination! The fabric seems more breathable. Very well made car seat! Great car seat! Very well made and super soft material! I love how easily you can tighten and loosen the straps! My son seems super comfortable in it! I love the fact that it's rear facing for up to 50lbs and proudly made in the USA! Our son is very comfortable in this seat so far and he enjoys car rides more than before. It is easy to use and great value for the price. this is a very comfortable car seat. has lots of padding and is very nice. the only thing i do not like about it is the install isnt as easy as some of its competitors.. I LOVE this car seat!! I was trying to find a car seat that would work rear-facing with my captains chairs (middle row of my SUV) with no luck, until I found this one! Others threw my son forward, even with the furthest recline. THIS CAR SEAT IS PERFECT for my chairs!! It reclines far enough that my son can sit comfortably and safely. I also gained an inch or 2 in the front seat (I was able to scoot the seat further back) due to the way this seat reclines. WOW! I also love the 5 point harness. It snaps easily, and the bottom can be done quickly, which is perfect for my squirmer. The ratchet system to secure the seat is also AMAZING!! 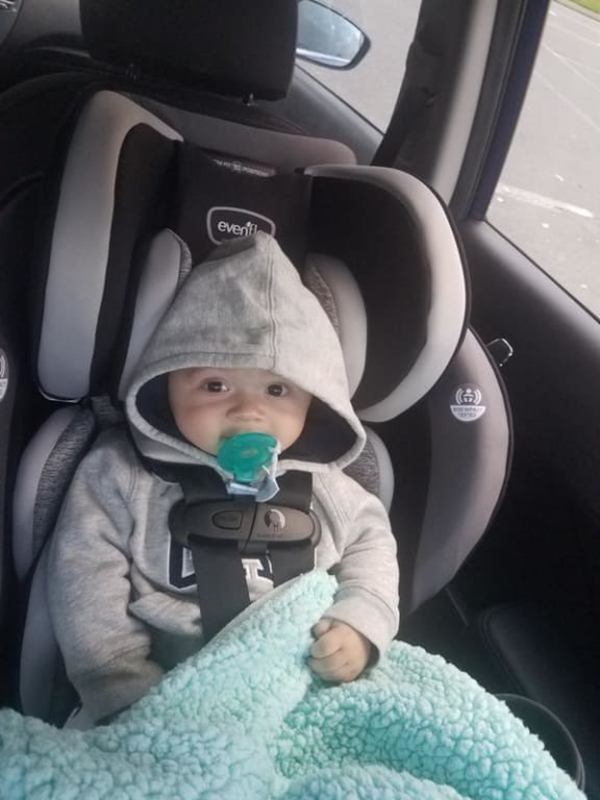 I have 3 children so we have owned several cars and have gone through several car seats, this is definitely one of the best ones without a doubt. A great investment, it is right in our price point but will have several years of use, and compared to other brands this is family budget friendly. First of all installation was a breeze! EASY CLICK!! literally just click and move to adjust, no more pinching my fingers, the same goes to move it out just pull and that's it!!! it took me seconds to do it!!! this is a big deal because we own 2 vehicles but rarely ride on the second one, so this seat definitely helped us avoid buying an unnecessary spare seat. I also used the lap shoulder seat belt for installation and it was easy to do as well, hassle free. I was a little bit hesitant with the size of the car seat at first because with my other son we used the symphony DLX and it was a big hassle to make it fit in my vehicles, with this one surprisingly it was not the case, I am still able to fit 3 car seats in the back of my Edge. The fabric is really soft and washable it is super comfy, a lot of cushion, and the best thing is that it keeps my baby in a good temperature, he does not get super hot during hot months. 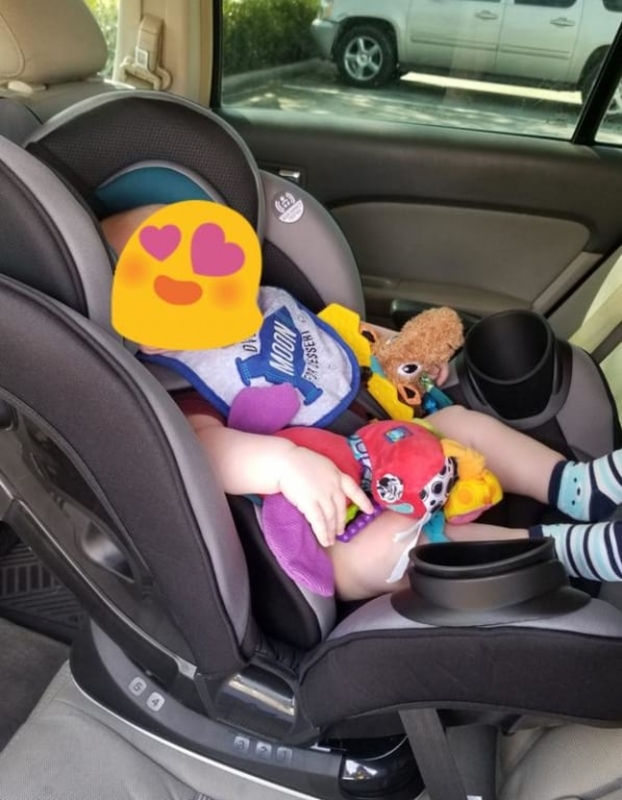 The cup holders are really helpful, I have my 9 month old in the middle with a 5 year old and a 9 year old on the sides, and their car seats have no cup holders due to space so now they are happy that their baby brother can share with them lol. Another great thing is how far it reclines, allowing my baby to ride comfortably, when he falls asleep his head does not tilt anymore and he has enough room in the chair to snuggle a blanket around him after we buckle him up. The only things that I have had a problem with are the strap that adjusts the seat-belt, when I try to pull it to adjust them snugly I have a hard time doing it, since it is rear facing if I want to pull it up it doesn't work so in order to pull it down I have to move the seat a little so it is a hassle. The shoulder cushions were too much and had to remove them, other than that it is a great fit for my family and it will last 10 years!! no need to buy more car seats which is a big deal. It was hard for us to switch from the click and go car seat. But the EveryStage provided us peace of mind. She looks so safe and secure when in this seat that it's hard to wake her up when it's time to get out. Last lament for the click and go. Like many of the reviews we instantly noticed the ease of installation. From the extra-long buckles that reach the hidden seat bars with ease, to the ratchet tight, the seat was simple and seamless. I've installed countless car seats and this was extremely easy. This is a priceless feature for us, as we are a generational house hold and sometimes have to move the seat between vehicles. The reclining feature is also simple and easy to adjust Like many people have mentioned, I feel as if we have already lost the cup holders. For such an age range of use, just storing the cup holders seems like an additional project I wasn't looking for. Additionally, they fell out with me brushing up against them. I anticipate that if I ever fish them out from storage that they too will become a constant game of lost and found. The edge of the seat that makes us feel as if our baby is safe and secure is also sometimes a challenge. With the seat in a reclining position the edge of the seat feels tall, and we have an SUV with high head clearance. We have to be cautious of not hitting our child's head on the roof of the car when placing her in the bucket seat. Also, there is a V gap in the bucket seat wall and sometimes her legs have gotten caught while we are placing her into her seat. All in all, we feel like she is super safe and comfortable. We just installed the EveryStage All-in-One car seat a couple of weeks ago, as our daughter is turning one next week. She's not a big kid (middle of the road in terms of the growth charts), but I could tell the infant car seat was getting a bit tight. She loves this seat! It's well-cushioned and comfortable, and big enough for her to stretch her legs and not look (or feel, I assume) cramped! Besides her comfort, there are many features that I love, including: *Good side-protection. Even though we put this in the middle position in the car, I appreciate the side protection on this seat. *Easy to adjust and install. It took very little time and effort to install, and doesn't slide around at all. Note that we did the seatbelt installation, not the LATCH, because that's not available in the middle seat of our car. *Doesn't take up a huge amount of space, width-wise. The car seat is in a Subaru Forester, and leaves plenty of room for passengers on either side. *Cup holders. Small but important feature that my daughter likes for bottles and snacks. Used on a Looooong (13 hour) Road Trip! Pro's: 1: Very sturdy feel 2: Easy to install 3: Quiet! Does not wake up the baby when he is removed from the car seat to his stroller! We are so glad about that one :) 4: Ratchet system gets a very tight latch! 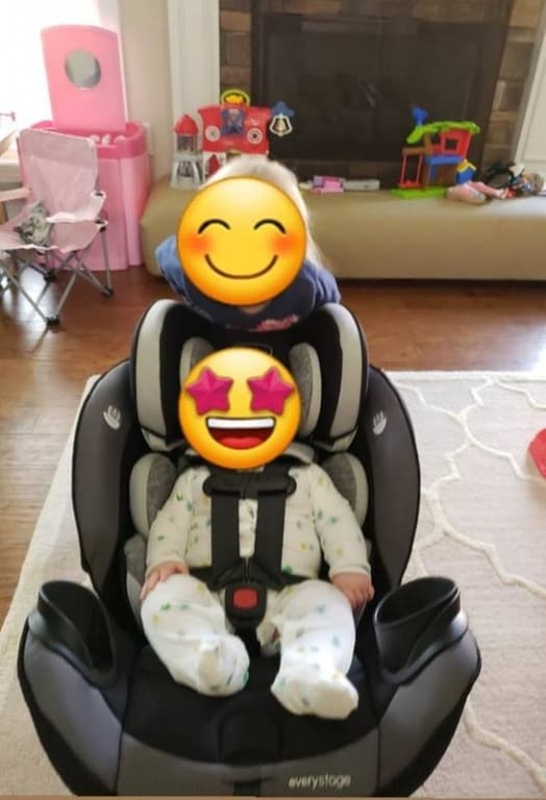 5: Seems roomy and supportive for our baby Cons: 1: Fabric strap cushions needed replaced (too small in length) Our family used this car seat for a 13 hour road trip with an almost 4 month old! At this point, he is 26.5 inches long and nearly 17 pounds and quickly outgrowing his infant car seat. We used the UPPA baby Mesa for the same 13 hour road trip and he seemed to cry more and feel cramped. 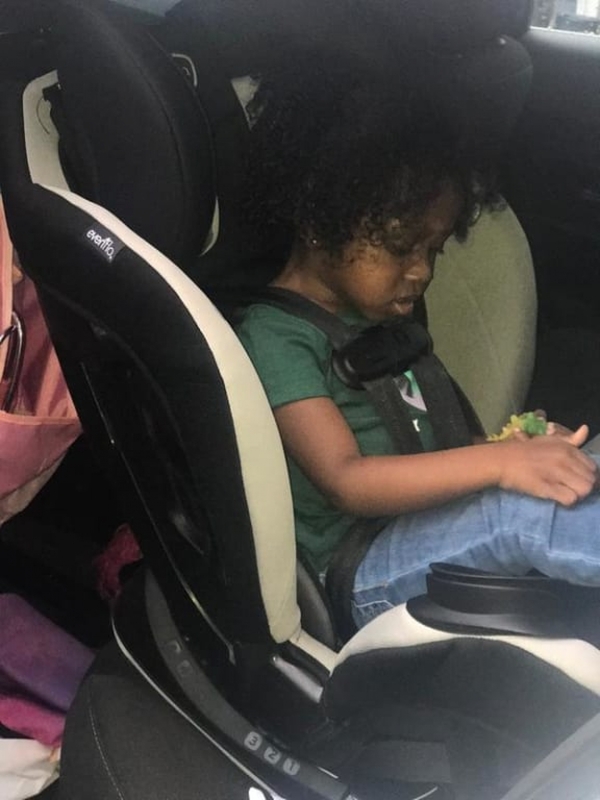 After using this car seat, the baby fell asleep! Roughly 1-2 hours per nap. When awake, he and was able to move around more it seemed. Whenever I have to remove this sleeping baby from the car seat to a stroller, the straps around his chest and legs remove quietly and quickly so that he does not stir himself awake. 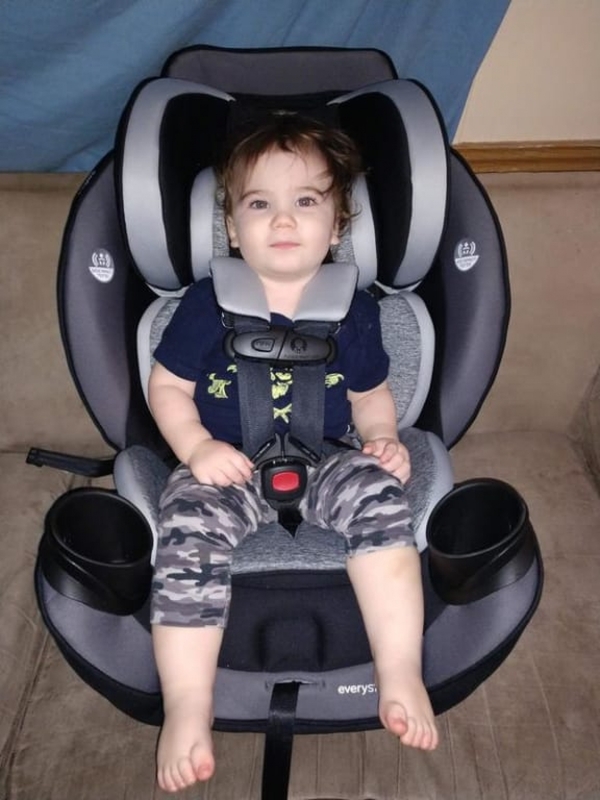 We love that he will be able to use this car seat for a long time and that it will adjust to his needs! We did replace the shoulder strap covers (too short for him), but after that easy fix, it's a blessing to our family! We would recommend this to others! I can say I really like this EveryStage DLX All-in-One Convertible Car Seat and feel my child is kept quite safe within it. This is padded very well and I feel the child is having a comfortable ride while being quite protected. This seemed pretty easy to get into the car, I did have my boyfriend do that part since it is a little heavier than I expected though. I REALLY love that this can be used for practically their whole life and converts along with their little growing body. I am definitely glad I got this product to try out. I appreciate the fact that Evenflo takes safety serious. Bonus that I can use the car seat for years, it grows with the kids, genius! I have seen complaints about the cup holder inserts, I love them. I like being able to clean the cup holder because it has a liner that is removable. I am so happy that I was able to install this myself with out my husband as well. Its a simple as cranking the handle down, genius! I am very happy with car seat, I have already purchased this exact seat for my sister who is due any day now! The seat is very well made and easy to install. I love the design and extra cushion for newborns. We were able to take the baby directly home from the hospital using it. She fit perfectly. I was not worried on the car ride home one bit. Everything fit securely and was easy to adjust. She was over 8 pounds so some adjustments were made as we were putting her in and it only took a second. Im excited to see this grow with her and the thought of never buying another car seat again is amazing to me!!!! Great car seat for traveling as well as for around town! The different recline options is nice to have. Fixing the harness straps is also super easy with this car seat. Love the different colors it comes in and so easy to install! My baby loves it. My son is so comfortable in this car seat. He's very tall for his age in the 98th percentile so we have him forward facing now and I actually feel safe with him forward facing. It's so secure and easy to install. Had a lot of protection too. He's loving the cup holders lol. Sleek design, love the color way, not as difficult to use unlike other name brands. Built relatively sturdy, I can trust this product for its safety. 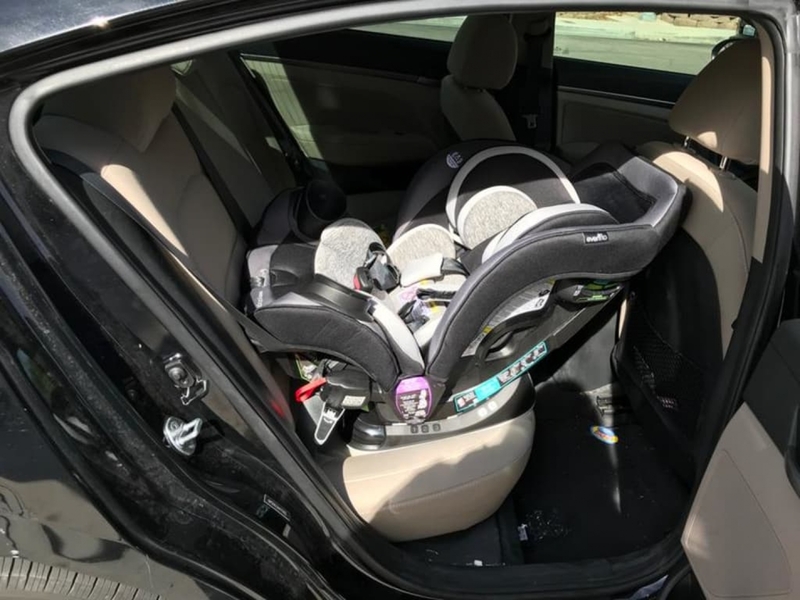 Purchasing a car seat for your first child can be stressful because there are too many to choose from. But it wasn't all that difficult to choose after reading very good reviews on the Internet. I'd highly recommend this car seat to my friends. 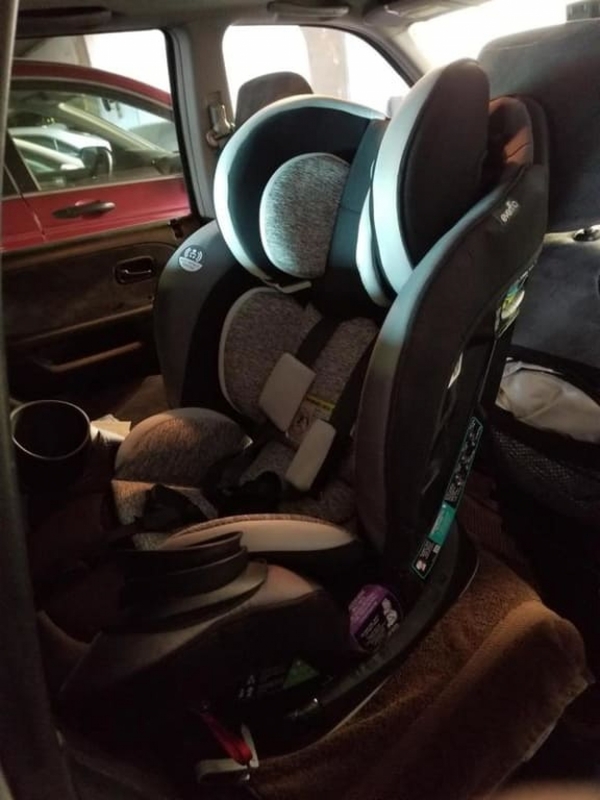 When I first took this car seat of out of the box, both my husband and I were surprised by the great quality and how nice it looks! Our favorite feature is the EasyClick Latch System. With the EasyClick Latch System, the car seat can be used between multiple cars as it is easy for anyone to quickly and properly install the car seat! 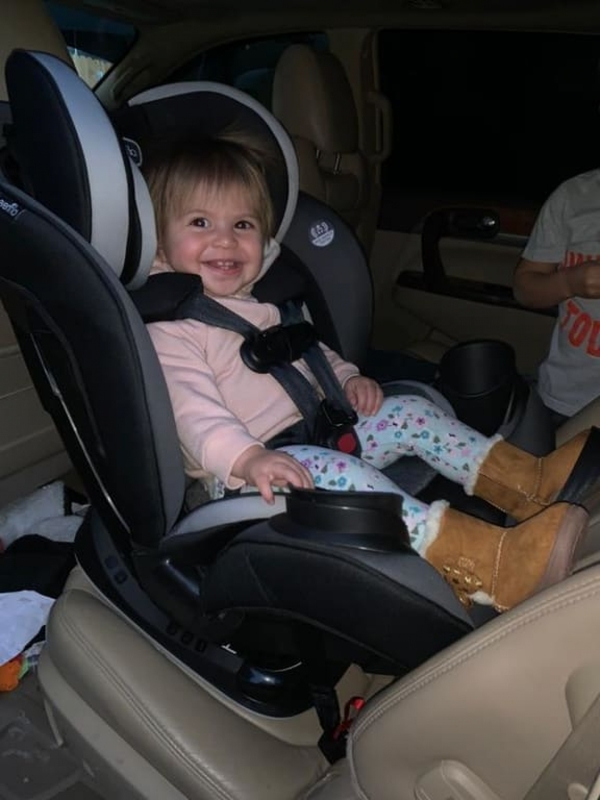 Unlike some of our other convertible car seats, it has gives our daughter great head support. She appears to be very comfortable while riding in this seat. We would definitely purchase another! 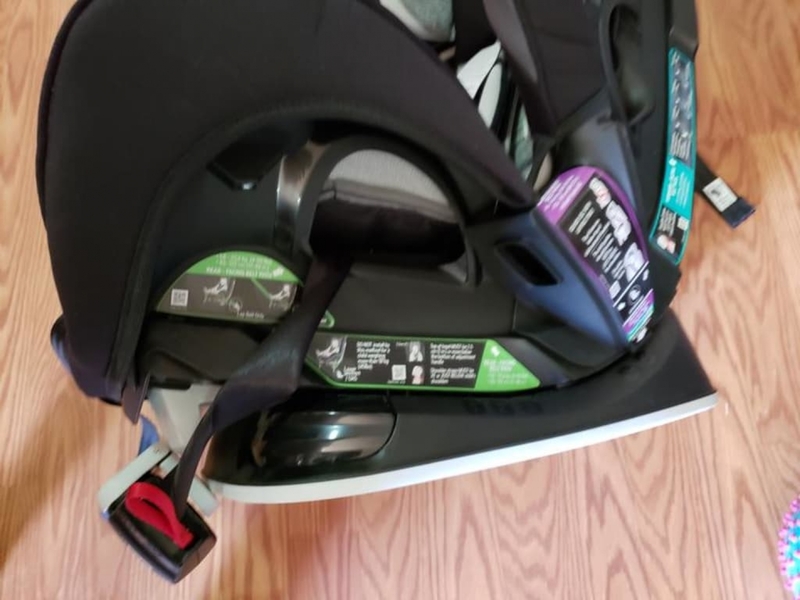 There a lot of good to say about this seat, but before I get into the details, I'll summarize by saying this is the best seat I own (vs. Britax Boulevard, Graco 3-in-1, and Britax B-Safe). I'm kicking myself for not finding this one earlier and saving myself a bunch of money and hassle. Installation: as any parent knows, correct installation of a car seat is of paramount importance for safety. This car seat is incredibly simple and easy to install securely. the clips easily clipped into my car's child seat anchors - much easier than my Britax Boulevard. 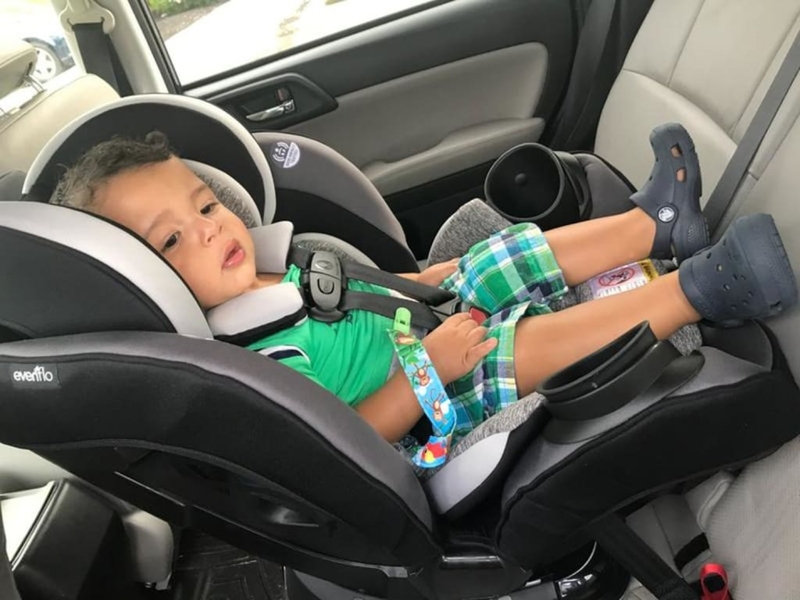 They can be equally as easily removed by pulling the red straps, which is very helpful when your trying to remove a car seat from a cramped back seat. The best part (picture included) is that the car seat strap is tightened down with a CRANK. This is SO MUCH EASIER and secure than any other seat i've used, which involves pulling on a strap with all your might and still not feeling like it's tight enough. Size - for a multistage seat, this one is reasonable size. It takes up the exact same footprint as my Britax Boulevard, which is much less versatile. I'm not saying it's small by any means - it's large and fairly heavy, but you want that in a car seat. Features - This thing has not one, but two cupholders. Maybe it's just my kids, but we always need water, snacks, and a couple of toys readily accessible. The cupholders keep things in easy reach and also spare my car's doors from taking the brunt of cracker crumbs and spilled squeeze pouches. Price - in the low $200s, this is a great value for the versatility and quality. The Evenflo All-in-One can be easily used from 4 month - 4 years. My Britax Boulevard was at least $300 and an inferior product in a number of ways, additionally it probably only fit my son for 2 years (8 most to 2.8yrs). Looks - least important, but the car seat is aesthetically appealing too. Coming from a veteran car seat owner, I highly recommend this product. I sure wish I had this seat when my oldest was born! Geez louise it is a chore to install convertible car seats, but not this car seat. The latching / ratching system made installation a breeze. I didn't even have to ask my husband to help me! I love all aspects of this car seat. I feel my children are safe in it because of its design and I will be purchasing a 2nd Canyons car seat for my other child. I love how these seats will grow with them, car seats are expensive and I am thrilled to not have to buy another, this will last for years. I like how the inserts can be removed and washed, crucial for a car seat because as you know kids can be messy! I have seen complaints about the removable cup holder liner, I think it is the bees knees and my kids have yet to remove them. I appreciate being able to wash them. The adjustable headrest is awesome as well. Nothing but praise for my Evenflo Everystage DLX all in one convertible car seat! My kids all tried this car seat out when it arrived. I don't know which they loved more; the big box or the car seat itself! The first thing I noticed was that it was really heavy. I am pregnant and didn't want to lift it on my own which made installing it in the van difficult. The car seat material is high quality and super soft and cozy with ample padding which makes long trips comfortable. The latch system was a little different than what I am used to but is definitely an improvement. We have used the Chicco Nextfit and the latch is sometimes difficult to tighten. But with this car seat the latch system has a turn handle that makes tightening a cinch! The handle can also tighten the latch strap so it's not in the way when using the lap belt installation. 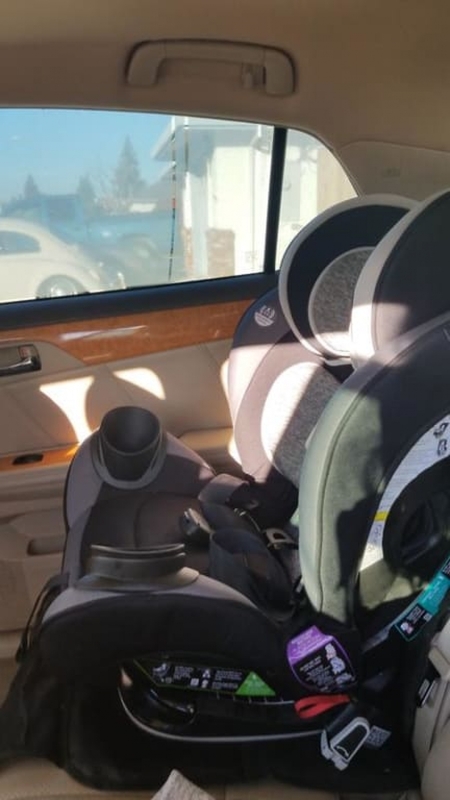 The car seat is equipped with two built in cup holders. It can be used forward or rear facing and comes with an easily removable infant insert. 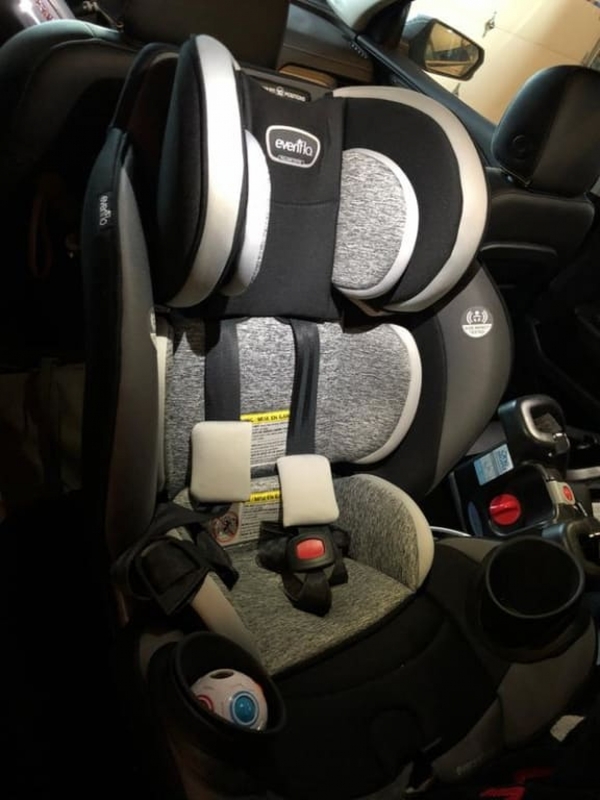 I am very impressed with the quality and design and although the heaviness of the car seat is great for safety it does make it a little more difficult to install. I would definitely recommend this product! I love this seat and my little one does too. The EasyClick feature made installation very easy but also made the seat very secure. The design and features, especially the head support and strap covers, are also great. Awesome product! I recieved this in exchange for an Honest Review. I LOVE THIS CARSEAT! it is sooo easy to install, the security clicks has a winch to tighten the straps! I love that i can use it for my 5 month or 2 year old. I also love that it has places to tuck everything into, so you dont get a loose strap floating around in your backseat. My toddler loves how comfy it is and how much leg room she has with it! I was honestly a little hesitant as we us we have only used Graco and switching brands can be hard . However, after the first few rides we wished we made the switch earlier . Our little guy is very tall for his age . Comfort is very important and making sure Mom ( who isn't as tall ) can put him in with ease . The car seat is the perfect size for him ! I could lift him in without bumping my head or his when placing him in the car seat . 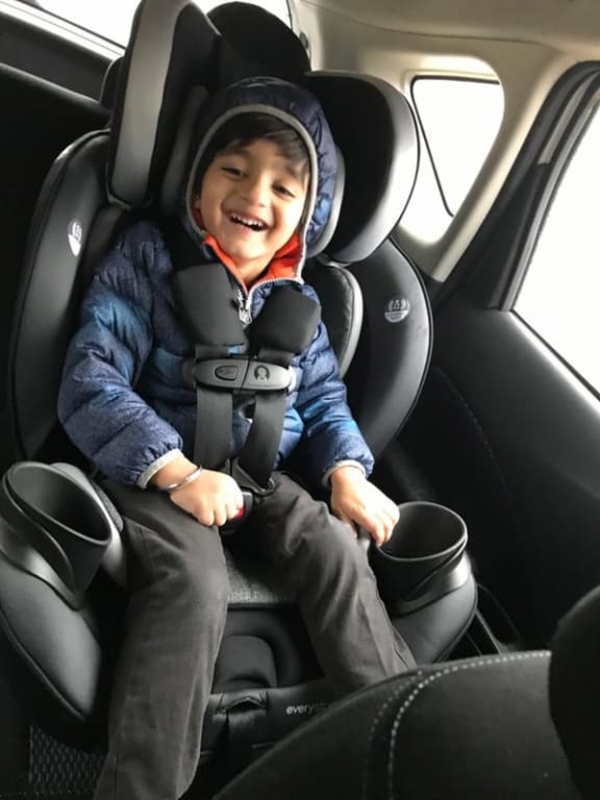 In addition to the size , the padding is very comfortable for parents who take their little ones on short and long drives . We have family out of state so making sure the car seat had foam padding was important . We love car seat !!! It fits wonderful in our Subaru . The directions were easy to install as they have online videos making it very helpful . We are very happy . I love this Car seat!!!! I got this car seat a couple weeks ago. 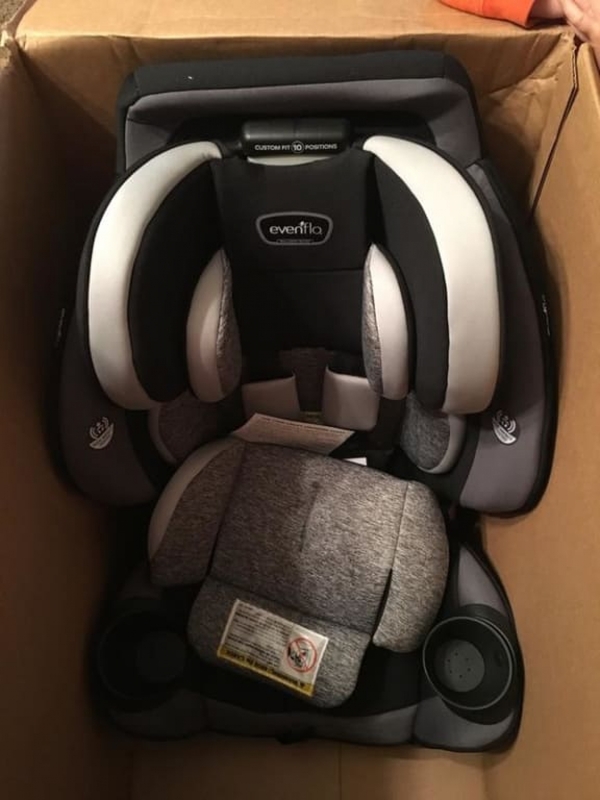 Transitioning my 10 month old from infant seat to the Evenflo Everystage DLX All in one was super easy. He loves his new car seat as much as I do. It was very easy to install in my vehicle. I love the easy adjustable harness and headrest. This car seat is very well made and gives me comfort knowing my baby is safe and comfortable. I absolutely love the new all in one carseat!! Just got the new Evenflo all in one carseat and I must say it has exceeded my expectations! My son is 7 months old and loves getting into it. It's a lot more comfortable than his previous one and we are pretty happy with it. It was easy to install as well. I love the overall look of it too! It has different recline settings which I like as well . I highly recommend!! Absolutely LOVE this car seat! I have used it with my 8month and 3 year old. It was easy to install with the click installation, it made it semi less to take in and out! By far THE best feature!!!!! I no longer had to wrestle trying to tighten the seat!! The seat it's self is comfortable for both children. My 8mo was snug and secure with all the head supports and padding and my 3 yo was secure but not restricted! The reclining positions for both rear and forward facing also added extra comfort to both children. The head rests and supports are some of the best I've experienced! No more flopping heads! The only negative I can say about this car seat is that the removable cupholders we a little too easy to remove and became a toy for my 3 year old and inevitably ended up on the floor of the car every trip. 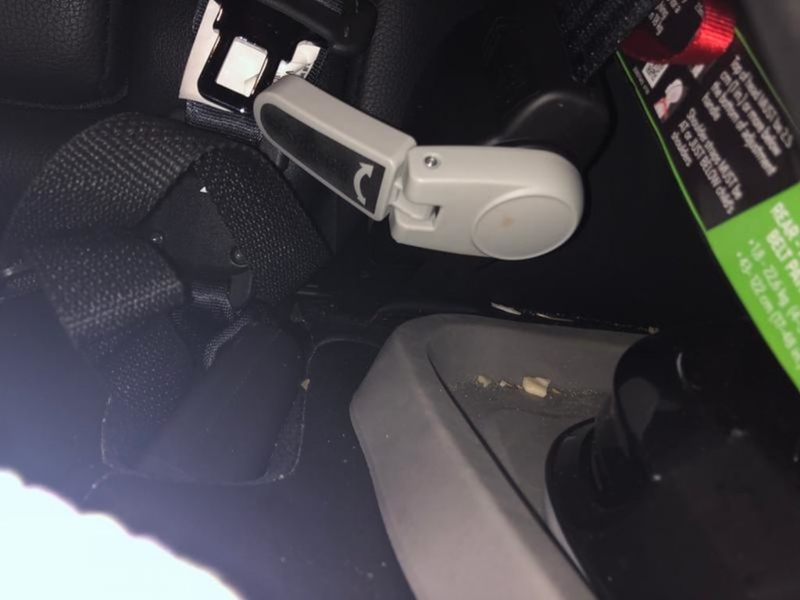 With that being said it is a small price to pay for all the other wonderful features this car seat has, especially the easy click installation! 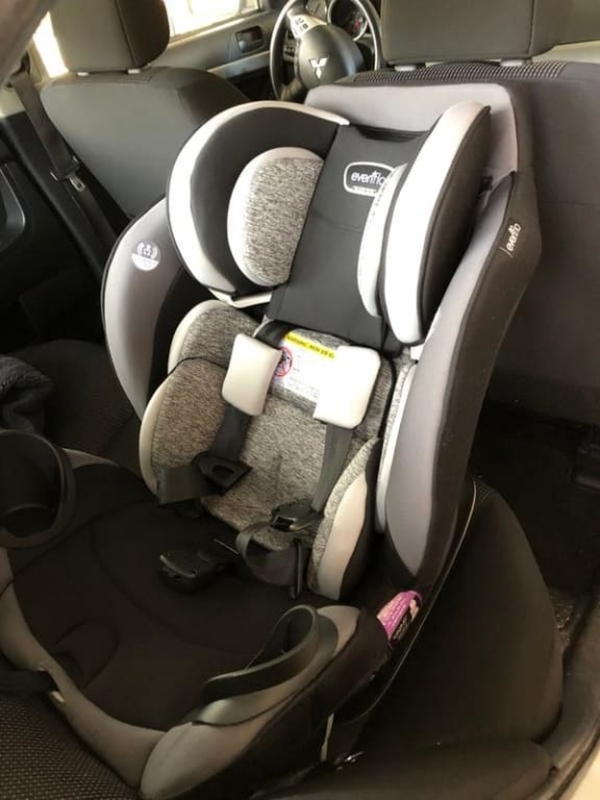 Great car seat and price point! My daughter outgrew her Infant Car seat and I started to look for a nice Convertible seat. I liked the look and design of the Evenflo EveryStage, it has a very elegant design and it's awesome that I can use it later one as booster as well! I was also pleasantly surprised how easy the Installation was. 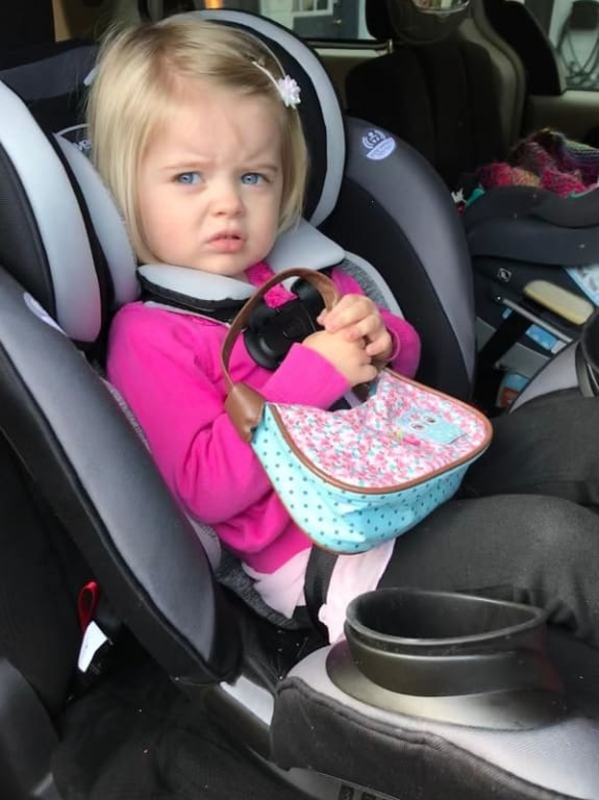 My daughter never really liked her Infant Car Seat and was always crying during trips with the car. She is always happy in her new car seat and sits very comfortably. The seat is also very easy to clean, sometimes so hard to get the crackers out of the seat! LO loves the integrated cupholders and uses them for her toys! Great product and so easy to use! Happy mama! 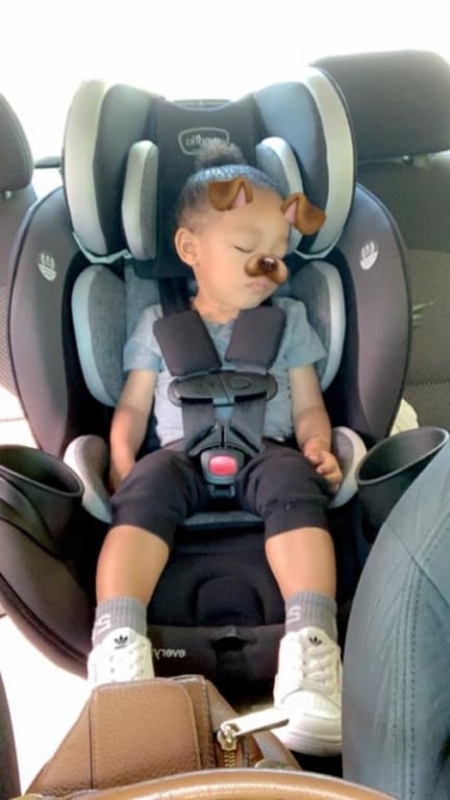 This car seat is really great for the growing babies as this designed with the safety features and keeps the baby safer than other car seats available in the market. Harness has 10 different positions which can be easily adjusted for the growing baby. It is very easy to install and very easy to switch between the vehicles.The fabric used in this is very high material and it can be easy to take off for washing.This is the perfect car seat to accommodate for the growing child and save money in the long run.I would highly recommend to anyone who is looking for convertible car for their growing child. Overall its a great car seat. First, the car seat seems very well made, comfortable and my little one is happy as can be in it. The setup and the adjustments are easy and pretty intuitive. But what really sets makes this seat is awesome is the LATCH and RATCHET system! It is so easy to connect to the anchors and getting the seat secured is a breeze. We have a different car seat in our second car and I absolutely dread taking it out because putting it back in is such a pain. Knowing that you can reinstall a car seat securely in seconds with no effort is so underrated. It's so nice to be able to easily clean the seat outside of the car, clean underneath the seat, fold the seat down when you need to haul something, or move it to another car as needed... A+ design. I love this car seat because the click connect makes it so easy to install. It is amazing when your car seat doesn't budge and your not questioning whether or not it is installed correctly. I also like that this car seat grows with the child. It can be used with an infant, toddler and as a booster. When I first saw the removable cup holder feature I thought - genius! But then after using it with our two year old I didn't like them as much. She can easily remove them and they are usually on the floor of our car.